As it turns out, I've been wrong for a while now, not because I had bad information, but because somehow I remembered wrong and once I said it, it was stuck in my mind that way. See, I've been telling people that James Crozier Huhn, my four-times-great-grandfather, was a soldier in the Civil War. Actually, he was my three-times-great-grandfather. I know, I know, not a big difference. But it does place me once generation closer to him and the Civil War. Because I'm a bit of a Civil War buff (just a bit; there are some crazy-knowledgeable people out there), I was excited when I learned that an ancestor of mine named James C. Huhn was a soldier in the Civil War. I was even more excited when I learned there was a pension record for him in the National Archives. Bonus: I live in DC, so it was a short trip down there to take look him up. And if you don't know, pension files are a treasure trove, because applicants had to describe not only their service record but also their current occupation and state of health. Turning over the hundred-plus-year-old pages, the outlines of a life jumped out at me. Right there before me were his exact age, height, and coloring when he enlisted in the army, the dates he was in hospital sick, his job in the army (blacksmith), and how/when/where he was injured (by the horses he was shoeing). Also of interest was what happened to him after the war, because it was after the war that he lost a foot and an eye in separate accidents. But this is something of an outline. Yes, I knew when he had joined and mustered out, when he had been injured and sick, but I didn't have a whole lot about his experience of the war. To find out a little more about that, I decided to research his regiment: the 14th Pennsylvania Cavalry. The unit was organized late in 1862 in western PA, and was comprised of largely of Germans. It took part in some minor action in West Virginia in 1863, and was part of the major campaign in the Shenandoah Valley in 1864 under Sigel, then Hunter, then (finally) Sheridan. This included the burning of the Virginia Military Institute, a defeat by the Confederates that allowed Jubal Early to raid into PA and harass Washington City, and (finally) a defeat of the Confederate army in the Valley late in 1864. 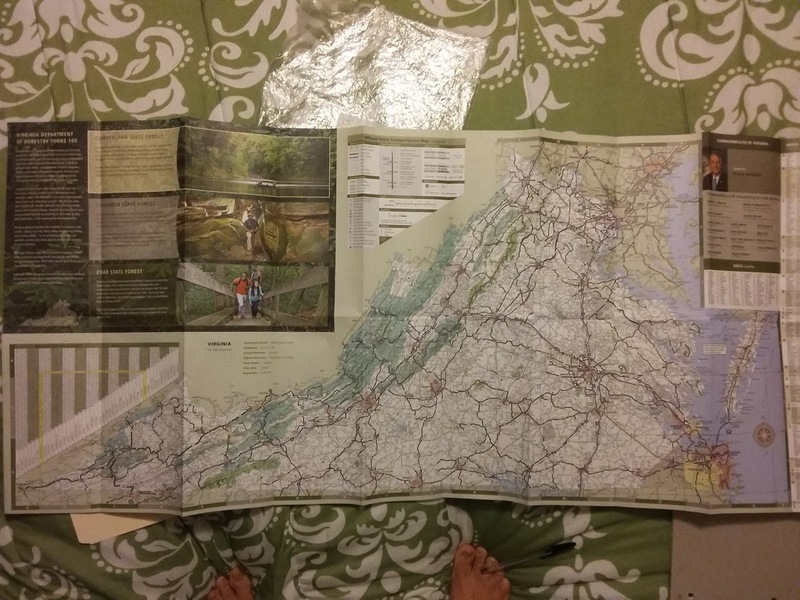 With this knowledge in hand, I started plotting out the places the 14th visited and the battles they took part in. Of course, I can't say precisely where James was during any given battle (except for the times he was in hospital), but I could say that at the least his buddies were there, and most likely he was there, too, shoeing horses and fixing harness. The map I used to plot it all out. Yes, those are my toes. two days off of work, and some friends suggested meeting up to visit Monticello on one of those days, so the week-long trip was pared down to three packed days. I have no regrets, though: I hit the highlights of the highlights, and felt I got even more out of the trip than I'd hoped. 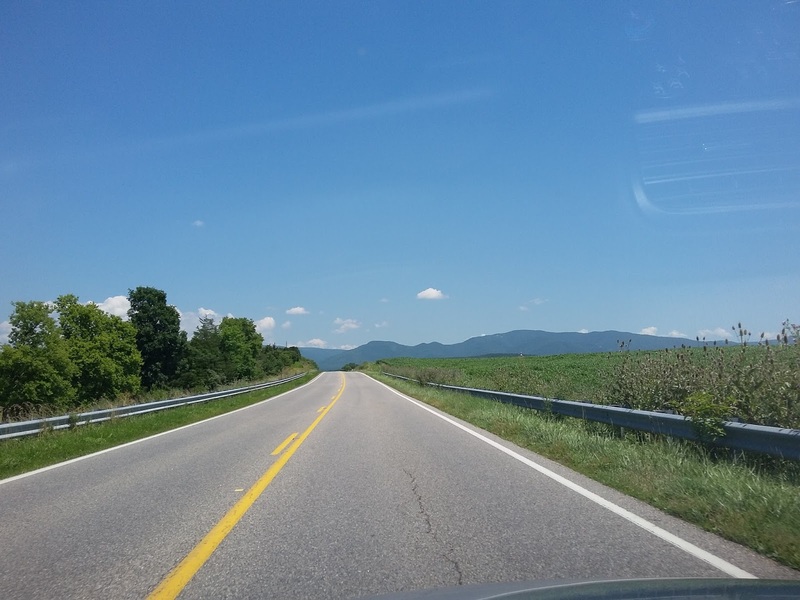 So on a fine, hot, Virginia day in July, having enjoyed myself the previous day at Monticello, I drove west across the Blue Ridge to the little town of Staunton. Which, as it transpires, is pronounced like Stanton. So, apparently, I've been saying it wrong all these years, just like I've been telling people my three-times-great-grandfather was my four-times-great-grandfather. Point one about Staunton: it is an adorable town. It's hilly and centered on the old train station at the bottom of the hill. There are houses, mostly wood-frame, clustered on the hillside, with sultry, narrow streets. It's a charming, gracious town--very "Virginia". After browsing a used bookshop and eating my lunch, I jumped in my car to cruise around and just take in the greens and blues of a sunny day, with the green mounds of the mountains hemming in the sky and earth on either side. Point two about Staunton: It was an important railroad town during the Civil War, and both armies passed through it repeatedly. Like Wimchester to the north, it changed hands many times. 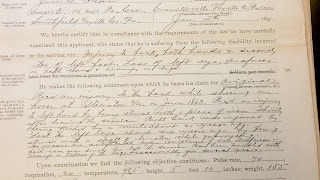 Point three about Staunton: this is where James was injured (by a horse) about June 1, 1864. 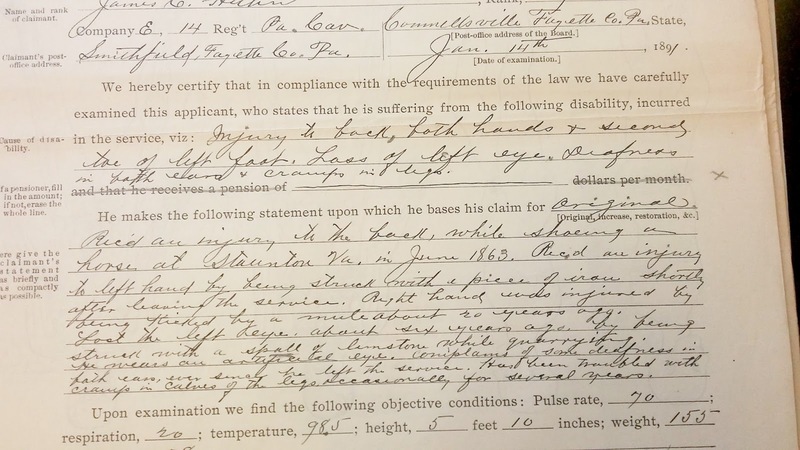 According to his pension record, "while shoeing a horse at Staunton, VA, [James] was thrown and badly injured in the back, from which injury he still suffers [some twenty years later]." rock. There wasn't a list of names on the website, and I wasn't sure if they would have such a list if I visited, but I figured that it was worth seeing the place regardless, since the 14th PA Cavalry, had been there. It was a short drive there from Staunton, though I did get literally sidetracked by historical markers that I hoped had something to do with the 14th (they didn't). If I hadn't stopped, I think the drive would have been twenty minutes grand total. The first thing that greeted me upon my arrival (aside from suffocating heat and a lot of picnickers--the cave is in the middle of a local park) was a historical marker. It talked a bit about Stonewall Jackson's legendary campaign in the Valley in 1862, and then it talked about how the 14th PA Cavalry bivouacked nearby and how some of them toured the caverns. As we left the welcome cool of the caverns, the guide handed me off to someone there in the welcome center. He had a similar reaction to the tour guide: slightly taken aback, pleased, and very much well-what-do-you-know. I eagerly asked what he might know, which wasn't a whole lot. He did say that the name James Huhn kind of rang a bell, and my little heart went soaring. But of course, being the cynic I am, I quite quickly put a damper on that nonsense. It was likely that he was mistaken, and given that all seemed pretty fuzzy about "records", I wasn't convinced that there would be any follow-through even if James's name were there somewhere. In an attempt to balance my optimism and cynicism, I left my card with James's name and my non-work email address. 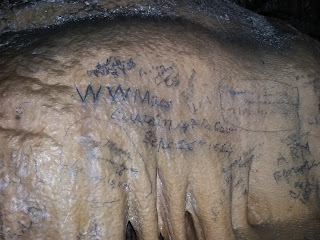 I asked them to give me a call or send an email if ever they come across James's name on their cavern walls. Will that ever happen? Who knows? James might never have gone into the caves, or he might not have signed his name, or he might have signed it somewhere that it hasn't been found. All I know is that I had a blast, and I kind of got goosebumps when I saw the name of one of James's compatriots . . . because down in the caverns it's a steady 55 degrees or so year-round! Stop number two for the day, about twenty minutes from Grand Caverns, was New Hope, VA, where the Battle of Piedmont took place on June 5, 1864 (about the time James was injured). There isn't a whole lot to mark the place. None of the land has been preserved as a park of any kind. There are two markers on the side of the road, one hidden in the bushes beside the fire station, one hidden amongst the tall corn. On the other hand, this is a small place. In the 1860's, there was just a scattering of houses. Today, there isn't much more. In some ways, the place has been preserved better than some major battlefields simply because no one has taken any interest in developing the area. As a result, it remains very much the same as it was in 1864: fields and pastures, with a few narrow roads (in the same places), all of it in the shadow of the mountains all around. (VA 778, Patterson Mill Rd) was there in 1864, and the 14th PA came sweeping south from a ridge north, turning slightly westward to follow the path of the road, and striking at Confederate cavalrymen. Riding along in the delightfully air-conditioned truck, it's hard to fully appreciate the conditions of that day. I could imagine heat, dirt, bugs, bullets flying, horses thundering everywhere. These were "small" battles, but that's like saying a house fire is "small" compared to a forest fire. It certainly doesn't feel "small." Having gotten the lay of the land, we decided as evening set in to bring things to a close. It'd been a long day, and it was time to retreat to Harrisonburg and the safety of a Hampton Inn. A brief epilogue: when we returned to the post office, I hopped out of the truck and heard a hissing sound. Even as I said, "What's that hissing sound?" I knew what it was: a flat tire. 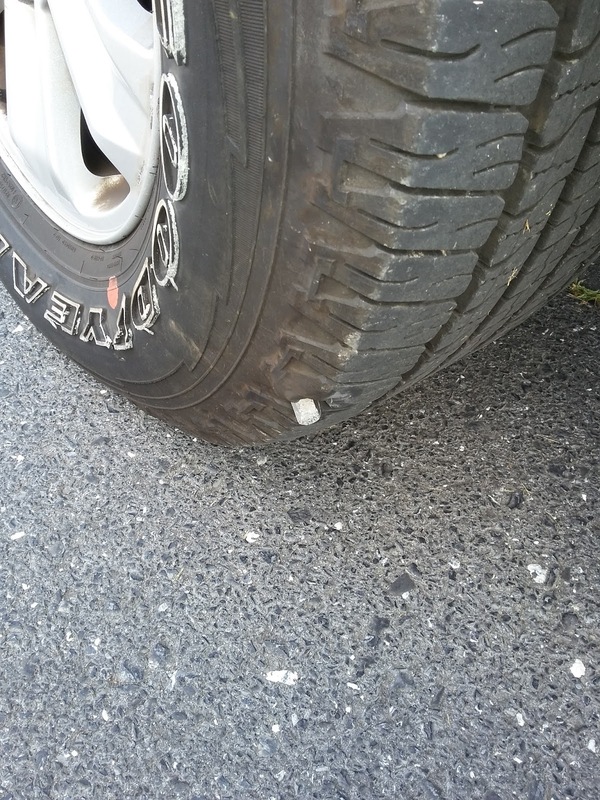 Somewhere in our journey of discovery, an enormous hunk of metal, like a piece broken off of a heavy metal rod about an inch in diameter, had punched right through one of the truck's tires. Dad got out the tools and the spare and got to work, while I, knowing I didn't have the skills or the strength to help, stood by and watched and tried not to get in the way. 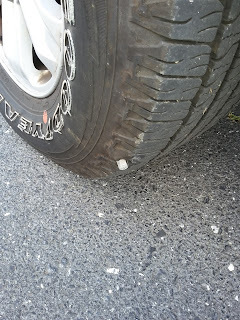 Maybe the ghosts of all those Civil War horsemen were frowning on our 21st-century mechanical beast and decided to puncture our complacency a bit by puncturing our tire. You make this so interesting !!!! When is the next installment? Hopefully this weekend, but no guarantees!